The Small Cinema * Wednesday (August 5, 2009) * 4:00 p.m. The castle in Kazimierz * Friday (August 7, 2009) * 10:00 p.m.
Close To Be A Millionaire, Poland (PL) 2008, colour, 7 min. 48 sec. Story of a young and ambitious shoeblack. 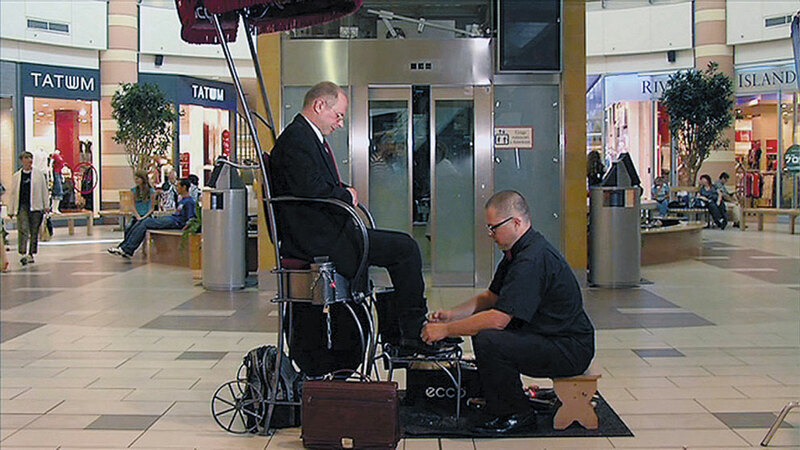 Everyday he appears in the Mokotów Gallery shopping centre in Warsaw to guard the shoes’ cleanness. However, he’s not only a shoeblack but also a dreamer. He believes in “the American dream”. He believes that sooner or later he will become a millionaire. Since someone succeeded in America, why could it not happen to someone in Warsaw? Two-time finalist of the contest of Hartley Merrill (2004 and 2005). His feature debut, “TAXI A”, is to be released in Polish cinemas in 2009.